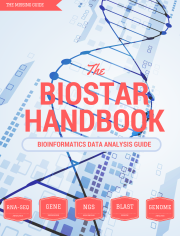 News: The Biostar Handbook. A bioinformatics e-book for beginners. News: Do you want to improve your knowledge and skills in the R programming language? News: Beyond pest control: What can we learn from parasites? News: 7th Annual Mendelian Data Analysis Workshop - Learn bioinformatic tools for analysis of exome and genome sequence data for rare diseases.